I love these big sixes! They don’t turn up as often as they used to and when they do they’re quite expensive now. They’re worth every penny though. This one isn’t quite as immaculate as it looks in these pictures. The black hard rubber section is faded and the high points of the clip have lost some of their plating. Still, that’s not bad for 60-odd years. 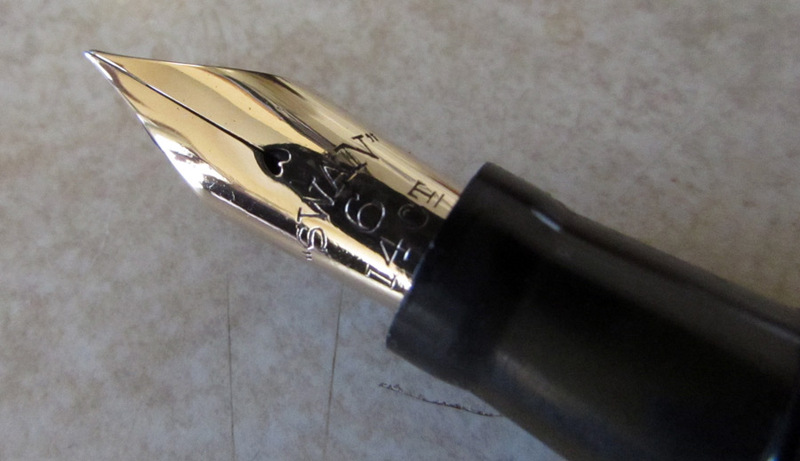 This splendid nib is still glorious and the plastic buffed up well. This was not a pen for the average person unless they were a real enthusiast. It was the doctor’s pen or the lawyer’s, or maybe even the bank manager’s, though back in those days they tended to be paid in the hundreds rather than today’s millions! Regardless of who bought it when it was new, it would have been regarded as a lifetime’s investment. And I’m sure it would have been, if ballpoint pens had not come along and spoiled the game! A pen like this really does put us in touch with its past. There were never all that many of them and they were bought with a purpose other than just writing. This was a pen that was intended to make their owner feel good about him or herself and it was intended to impress those with whom he had dealings. I’m sure it did. All these years later it still impresses me! That is one glorious nib. I don’t think I’ve seen one yet. It’s big enough to dig the garden with! Sounds like you have a great pen! Hi Deb, I did some research and this is the Swan Mabie Todd no 2060. Again, a pure gem. This pen was not assigned a number by Swan. Yes, we can calculate that it is a 2060 but that hasn’t been imprinted on the barrel. A large proportion of Mabie Todd pens were issued without model numbers. I report what I see, and what we have here is a large no-number pen with a number six nib. I see, thanks for that interesting info Deb… this is a strange practice though…Do you think that discrepancy in printing / not printing # was something current in the war era, or it has nothing to do with the socio-economic context? They began issuing pens without numbers long before World War II and the practice continued until they went out of production. I have no idea why they did that. Perhaps imprinting the model number was not of primary importance to either them or their customers. The customer knew what he had bought and didn’t need to be reminded of it. However, I would have thought that the presence of the model numbers would be very helpful to retailers. Really, we just don’t know why they did things back then.